What the blurb says: “When the body of journalist Duncan Brown is found in the back of a rubbish truck, Inspector John Carlyle is thrown into the middle of a scandal that threatens to expose the corrupt links between the police, the political establishment and the hugely powerful Zenger media group. I couldn’t help but warm to Inspector Carlyle. He’s a good bloke, battling a heavy workload in order to do a good job and solve his cases. And he’s got a lot on his plate, a targeted bomb that kills a teenager, a missing girl, and the murder of journalist Duncan Brown. As Carlyle digs deeper into each case, he discovers a web of crime and corruption that stretches far into the halls of power in London. What made the story seem especially realistic for me is that it covers a number of themes that mirror much of what has happened in recent times, like phone hacking, and doesn’t shy away from showing a rather seedy side to journalism, politics and police work. This is the fourth book in the bestselling Inspector Carlyle series. It’s a gritty story, set in a sinister London, and one that will have the reader trying to puzzle out both who did it and why did it. I think fans of police procedurals will certainly enjoy this one. 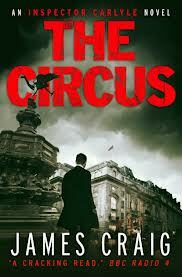 The Circus by James Craig is out now, published by C&R Crime. I’ve just finished this one & am yet to write my review. Was surpised how much Carlyle managed to achieve without actually seeming to do very much!